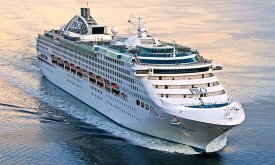 The 1997 Italian built 77,400 grt ' Dawn Princess ', which at present operates for Princess Cruises from Australia, will be transfered to P & O Australia in June 2017 after a refit which will include the addition of water slides which will go out over the side of the ship with a section being a clear persplex tunnel ! These water slides have already been added to some of the other P & O Australian cruise ships during recent refits ! This 1997 built cruise ship is to be renamed ' Pacific Explorer ' and will join the other old cruise ships operated by P & O in Australian waters most of which have been transfered from other group companies operated by Carnival Cruises..
Artists picture of the ' Pacific Explorer ' in her new P & O colour scheme, for P & O Australia, after being transfered from the Australian based Princess Cruises fleet where she was the ' Dawn Princess '. She is also due to have an interior refit before entering service..